Flow psychology is an area of study brought to the forefront by Mihaly Csikszentmihalyi in his well known book, “Flow – The Psychology Of Optimal Experience”. Although a relatively new concept to the Western mind, the flow state is a functional mode of 'being' that eastern meditation masters have been pointing to for millennia. The eastern masters describe this way of functioning as ‘being at one with things’ or ‘being at one with what you do’. This may sound esoteric to western ears, but this is actually a simple description of being in flow. Understanding the flow state, and how to tap into it, is to understand how to bring more vitality, intelligence, creativity and pure joy into our lives. According to Mihaly Csikszentmihalyi, as outlined in his book “Flow – The Psychology of Optimal Experience”, the ‘flow zone’ is most readily accessed in situations that are challenging and which demand a relatively high level of skill. Other states of mind are also influenced by the relationship between level of challenge and level of skill as shown in the chart below (illustration courtesy of Mihaly Csikszentmihalyi and Wikipedia). The chart above illustrates some very interesting points about flow psychology that can be utilized for ongoing personal growth, self improvement and motivation. 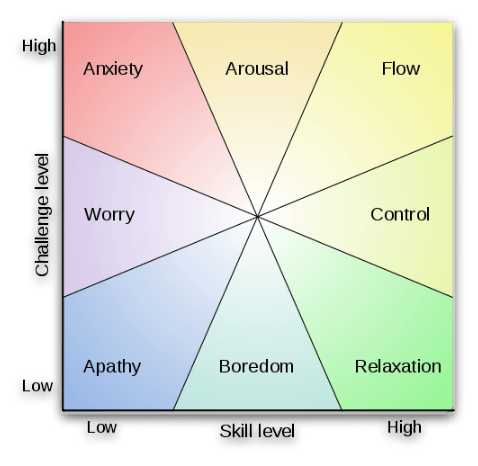 One thing that becomes apparent from the chart is that the flow state isn’t readily accessible when we are in what may be considered ‘negative’ states of mind such as anxiety, worry, apathy and boredom. If we are feeling apathetic, bored, worried, or anxious, we aren’t likely to experience a flow of engaging activity. To experience flow, we will want to experiment with arousal, control, or relaxation in order to shift into a more positive frame of mind. Taking a closer look at the chart shows that apathy is the opposite of being in the flow zone. Apathy is at complete odds with experiencing flow. If you find yourself apathetic, don’t be afraid to shift into worry or boredom. This transition, although seemingly negative, actually brings you closer to the flow zone. Another interesting point revealed in the chart above, is that the two mental states that are closest to the flow zone are arousal and control. This may very well explain why the martial arts and other mind-body disciplines such as yoga and meditation can be so powerful at inducing the flow state. For example, a meditator who is highly alert and vigilant, while deeply settled into a controlled posture, is capable of experiencing the 'flow zone'. To a greater or lesser degree, most mind-body disciplines offer a strong combination of the elements of arousal and control. As stated beforehand, the flow zone is most readily accessible when levels of arousal and a sense of control are high. This is the feeling we are looking for; this is the feeling to follow. Intensity and aliveness are central characteristics of flow psychology. They both lead us to the flow zone. While flow and apathy occupy opposing corners in the square above; so do relaxation and anxiety. We are generally relaxed in life when our perceived skill level is more than enough to meet the daily challenges we face (ie. in situations of high skill / low challenge). We are generally anxious in life when we perceive our skill level to be nowhere near enough to meet our daily challenges (high challenge / low skill). If we find ourselves generally relaxed in life, yet unhappy because we aren't reaching our potential, then we can actively take steps to move ourselves closer to the flow zone. Borrowing from flow psychology we can do this by seeking to increase the level of challenge in our lives. Increasing challenge will move us out of relaxation and give us a sense of heightened control. This brings us one step closer to the flow zone; the place where optimal experience resides. By the same token, if we find ourselves generally anxious in life, once again we can take steps to move ourselves out of a negative state of mind and closer to the flow zone. In this case, we do this by working to increase our skill level (or perception thereof). An increase in our perceived and/or actual level of skill, will move us from the state of anxiety into the state of arousal. This brings us within close proximity to the flow zone. This is how we can use flow psychology to gauge where we are at in our lives at any given point in time. Once aware of our 'position' we can decide on the optimal conditions to forward our personal growth, self improvement and motivation. A powerful way to connect with the principles of flow psychology within our own body and mind is through creative interactions with the power of subconscious mind. Working with the creative subconscious mind is also an exercise in flow. As we learn to relax and let go ... as we surrender resistance and turn ourselves over wholeheartedly to communicating with the subconscious mind - we find our energies beginning to unite. Communication turns into communion and we enter a state of flow that is optimal for personal change and transformation. The ‘flow’ is much more than an intrinsically satisfying and rewarding state of being. It is also a 'place', that when visited, brings out our very best. Tapping into the flow zone we are able to bring the potential of each moment to life. Our experience in the state of flow becomes a moment-to-moment self actualization. 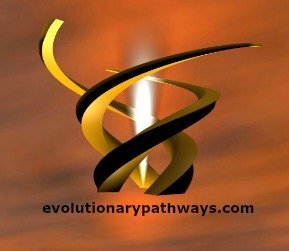 In this way flow psychology becomes an important part of our evolutionary path.